Beautiful green blooms steal the show from summer to fall. Strong stems keep the flowers from fall over. Invincibelle Limetta Hydrangea arborescens flowers open in early summer as lime green softening to greenish-white and then variations of jade green on to fall. Six hours of sun is recommended. In areas with hot climates, some afternoon shade would be best. Prune in early spring removing any dead wood cutting entire plant back by about one-third its total height. 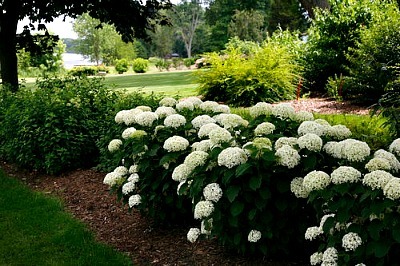 Mulch your Invincibelle Limetta Hydrangea with 2 to 3 inches of shredded bark mulch. Fertilize in spring. Smooth hydrangeas are native to North America and grow wild in central and southeastern U.S.
Hydrangea Invincibelle Limetta is grown in a quart pot. Orders shipping to AZ or CA addresses will be bare rooted and root washed before getting prepped for shipping.